On March 31 2018, the Carnegie Museum of Art opened Hiroshige’s Tōkaidō Road to the public. It is the museum’s first exhibition of the Hōeidō edition of the Fifty-three Stations of the Tōkaidō in 25 years. This frequently-requested series of Japanese prints was introduced with ample information and enthusiasm during an opening lecture given by University of Pittsburgh professor and Japan Studies Coordinator Brenda Jordan, titled “A City of Consumption: The Woodblock Print Industry in Edo, Japan.” In her lecture, Dr. Jordan discussed the collaborative process of woodblock printmaking, as well as the timeless nature of Hiroshige’s Tōkaidō Road series. Just like any other Japanese woodblock print series, The Fifty-three Stations of the Tōkaidō required the collaboration of several skilled craftsmen in order to create a finalized print. This process began with the designer of the original image, who is usually the most well-known of the collaborators, drawing the intended design onto paper. After the designer is the woodblock carver, whose role is to whittle the base of a wooden block according to the drawn image; and then the printer, who inks the woodblocks and presses the prints. Finally, there were others who financially supported and distributed the works. 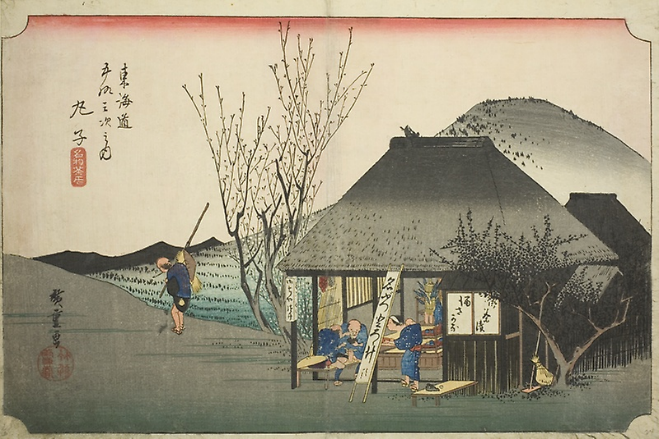 In Utagawa Hiroshige’s case, the finished works were sold along the Tōkaidō road to collectors and travelers alike, either as souvenirs or as fine art to be displayed in one’s home. 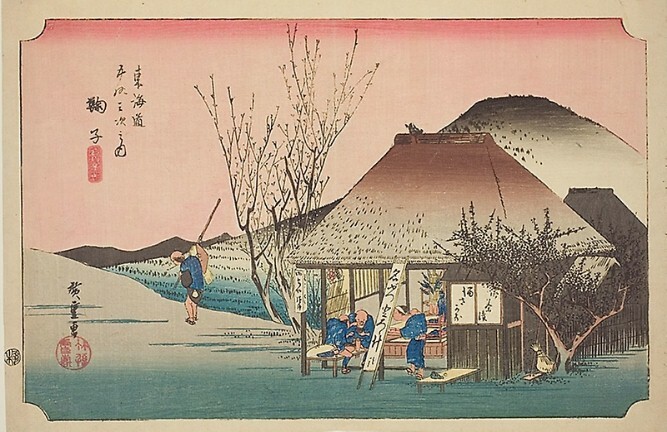 The Hōeidō edition was so immensely popular in its time that while many contemporary series produced around 8,000 copies, Hiroshige’s Fifty-three Stations of the Tōkaidō was printed a staggering 20,000 times. This popularity was largely due to the timeless aesthetic of landscape prints compared to contemporary prints of popular subjects, such as those depicting courtesans or actors. When entering into the Hiroshige exhibit itself, visitors are invited “to follow in the footsteps of a 19th century traveler” and “proceed from Edo to Kyoto.” On the gallery walls are the Tōkaidō road prints themselves, some of which are duplicates that might easily be overlooked. Though woodblock prints are usually all printed from the same blocks, each print is unique due to variations in color, brightness, and quality from one printing to the next. One such print, the 20th station of the Tōkaidō, Mariko, is riddled with differences between prints. Immediately apparent is the difference in color between the two on display, but upon closer inspection, there is a spelling mistake corrected in the later printings; 丸子(Maruko) became 鞠子 (Mariko). The subject of the 20th station print is a Mariko teahouse known for its tororo jiru, a yam paste, for which the establishment remains famous to this day. The teahouse, or ochaya, also offered female entertainers, known as geisha, who, according to Japanese folk music, made it a necessary stop for traveling men. Looking to the background of the print, there stands the “Fuji of Mariko,” which references an aspect of Japan’s shared cultural knowledge that Hiroshige did not hesitate to draw upon throughout many of his works. The gallery also includes many elements other than the prints themselves allowing visitors to interact with and appreciate the culture of Japan. 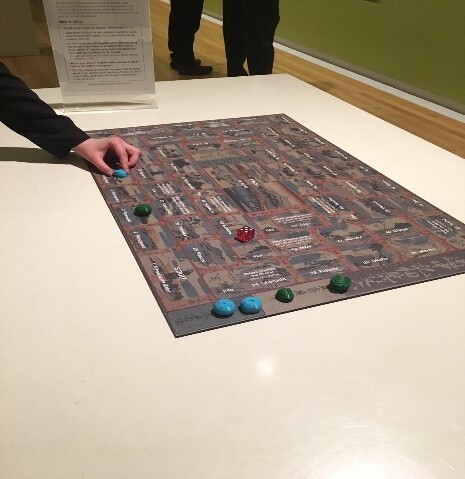 A 19th century-style board game set in the middle of the gallery attracts the attention of wanderers from the path (such as ourselves). Players can roll a die and advance along spaces that represent stops along the Tōkaidō Road in the style of Monopoly. Some spaces even listed happenings, such as delays crossing a river, adding a fun interactive element to the show which no doubt will interest many younger visitors to the exhibition. In addition to the game are two carved woodblocks, akin to those used in the printmaking process, open for visitors to touch. 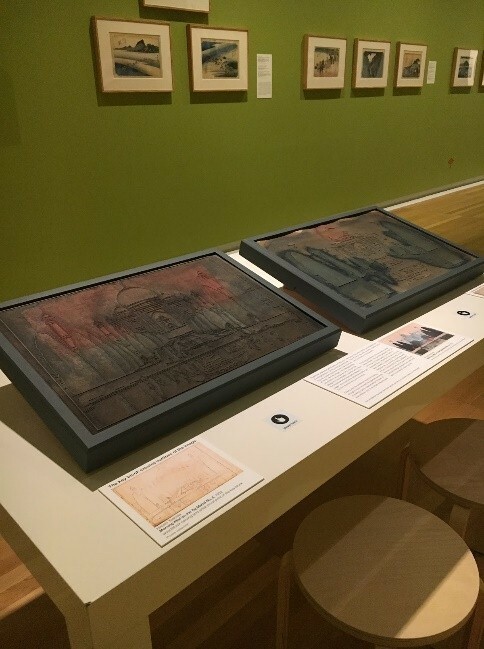 This tactile element offers a tangible peek into the creation of a woodblock print, as well as making the exhibit more accessible for those who are not sighted. Japanese woodblock prints are among the most recognizable works of art, yet the history of this medium is not often told. 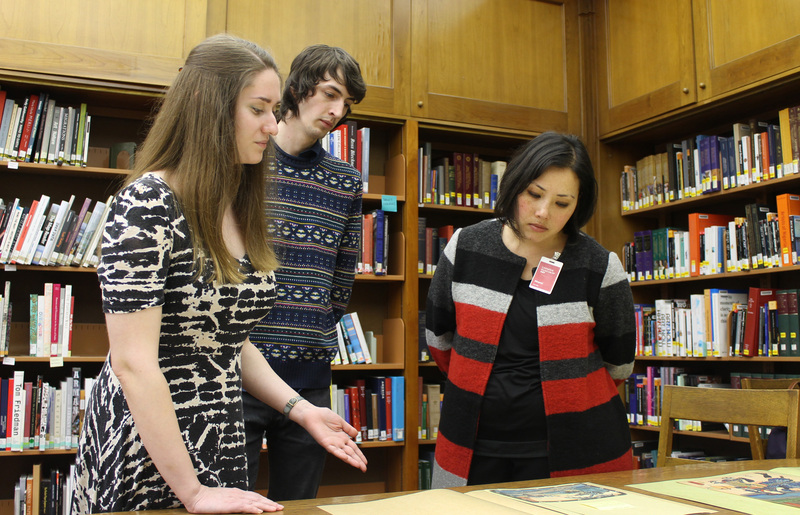 Our experiences in talking with Akemi May, curator of the exhibition, and listening to Dr. Jordan’s lecture, educated us in the printmaking process as well as printmaking’s historical context, enabling us to appreciate these prints for far more than just their aesthetic qualities. We encourage everyone, young or old, to venture into the world of Japanese printmaking by exploring the exhibit before it closes on July 22!